9175 ft (2797 m) . Broken Top is the oldest and most eroded of the five major volcanoes in the Three Sisters region. Several hundred-thousand years ago its summit probably topped 10000 ft (3000 m) as do the present summits of the Three Sisters, but glacial erosion has now removed all of the original surface and carved deep into the interior, revealing the innermost structure of the volcano. The highest remaining points form a horseshoe open to the south, surrounding what was once the crater of the original volcano. Glaciers continue to grind away at Broken Top today: the Crook Glacier occupies the central portion of the crater bowl, while the Bend Glacier flows in a series of jagged tongues down the steep northern flanks of the summit ridge. Although the uppermost rotten lava pinnacles are never quite skiable, there are a number of worthwhile ski routes both inside the steep confines of the crater and along the somewhat gentler ridges and flanks on the outside. In addition, Broken Top has relatively easy access throughout the winter and early spring from the Mount Bachelor Ski Area, while all of the roads accessing the central portion of the Three Sisters Wilderness are snowcovered for many miles. Ski Mountaineering Routes: NOTE: All ratings are for ski routes only up to the base of the summit pinnacle. 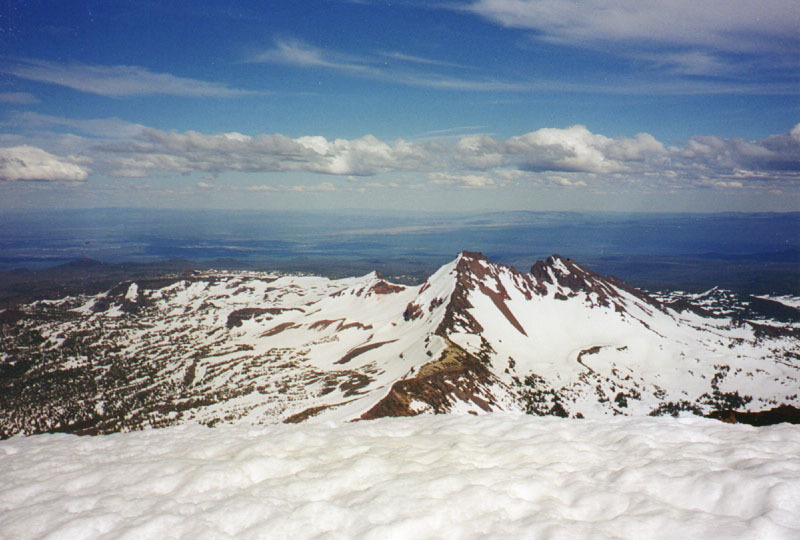 (16 km) This is the most prominent route on visible on Broken Top from the highway, dropping in a direct line from the Southwest Summit. In spring it is possible to ski from just below he highest summit rocks, although its windward and southern exposure results in early loss of snowcover. Unfortunately the access is not as direct as the ski line, requiring a long traversing ascent from Todd Lake once the road is plowed in late spring. In winter (when the route is likely to be more skiable), the approach is 2 miles (3 km) longer, starting from the Mount Bachelor Ski Area or nearby Dutchman Flat Snow Park. (18 km) The huge eroded Crater Bowl holds a variety of skiable lines, most of which are very steep and exposed to avalanche, and rockfall hazard. These two gully are the most prominent and safest of these choices, although the First Notch often has huge cornices at the top in early season. The Crater Bowl holds skiable snow into late spring and even early summer, when the avalanche and cornice hazard is somewhat less, so it is probably preferable to go after the road is plowed to Todd Lake. (13 km) The shortest access to routes on the west side of Broken Top is via the Green Lakes trail, starting from the highway at the north end of Sparks Lake. Unfortunately the road is not usually plowed until late spring, adding 4 miles each way plus 900 ft of elevation loss (coming in) and gain (going out) to early season trips. That said, some of the best ski terrain on Broken Top is found on this side. The fall line of the Southwest Face drops naturally to this side, providing a more direct runout instead of the traverse needed to return to the Todd Lake side. The West Face has a variety of skiable lines, descending from high up on both the main (north) summit and the southwest summit and also from the various notches along the ridge in between. The Northwest Ridge provides the gentlest ascent, and leads to the easiest summit climbing route, but has the longest access of these three routes. All routes on this side lose their snowcover somewhat early due to the windward aspect, especially on the upper parts, but the NW Ridge is most prone to this problem. In that case one can climb the ridge and ski down via the edge of the West or North Face. 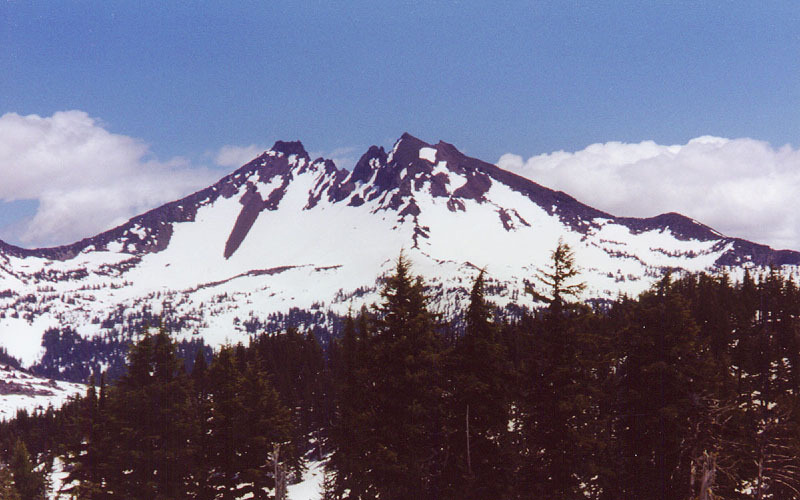 (29 km) The North Face of Broken Top is extremely steep, with many areas of near-vertical crumbling volcanic rock above the shattered segments of the Bend Glacier. 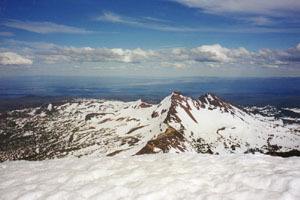 However, the westernmost portion of the face, just along the Northwest Ridge, offers the possibility of a ski descent from the very edge of the summit block of Broken Top. Access to this area is very long, starting along the Green Lakes trail from either the south or north end (at Pole Creek). (29 km) Tam McArthur Rim is a prominent north-facing lava escarpment and plateau which lies on the northeastern side of Broken Top and forms a spectacular, high viewpoint for the entire length of the north-central Oregon Cascades. This long, gentle route leads up the snowcovered Three Creek Road and then the contours around the east edge of the Rim to gain the plateau. Steeper ascent and descent options head more directly southwest from Three Creek Lake. 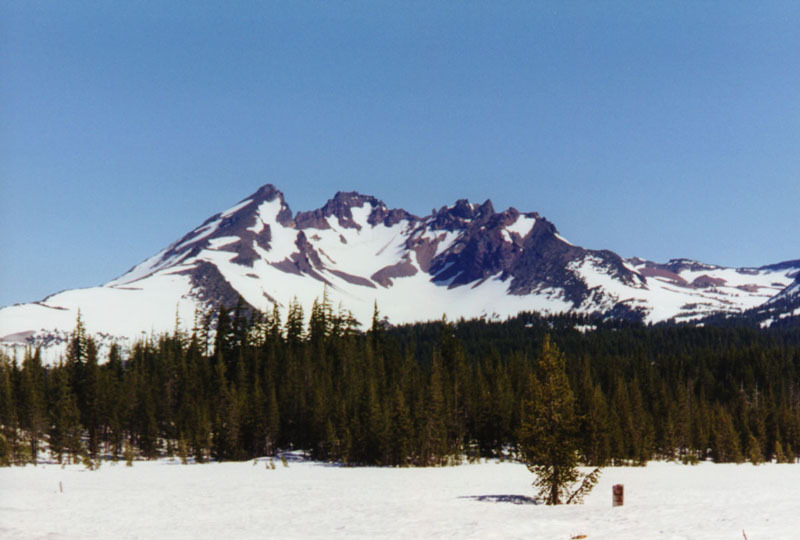 The open slopes of the plateau can be followed west to Broken Hand, an outlier peak separated from the main massif of Broken Top by a recently deglaciated cirque containing a large alpine lake. (16 km) Ball Butte is the most southeasterly peak in the Broken Top massif, and the closest to the Cascade Lakes Highway. The west side is a steep cliff, but the eastern half is a gentle slope whose leeward aspect builds up a deep snowpack. A variety of lines are skiable on Ball Butte and neighboring high points, and access is easy in all seasons. Upcoming additions: Topographic map showing all ski routes. most snow shown on this map is not permanent. Please contact me with any suggestions, additions, or corrections.